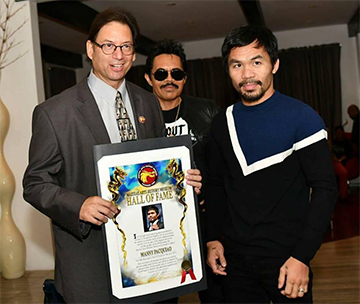 Burbank, Ca – For his role in bringing world-wide attention to the art of boxing and opening new opportunities of athleticism within the Filipino community, this week, world champion Manny Pacquiao was inducted into the Martial Arts History Museum's Hall of Fame. Recently, the art of boxing has been included into the Museum and Pacquiao is the first boxer to receive this great honor. Pacquiao, an eight-division world champion with over ten world titles and now Senator of the Philippines, was presented with the induction by museum president Michael Matsuda. “I want to thank the Martial Arts History Museum for this great honor into the Hall of Fame. This is very special for me,” said Pacquiao. The art of boxing has always played a unique role in martial arts history. Although most people attribute martial arts primarily with Asian forms of combat, it was in the 1970s that a new form of martial arts was established called Full-Contact Karate, aka Kickboxing. It was a time in which traditional martial arts styles were making an attempt to leap into a more boxing-style format. Unfortunately, it was a disaster as century-old techniques could not be properly applied in this type of format. As Kickboxing was barely surviving, it was pioneers such as Benny Urquidez and Howard Jackson who applied boxing into the Kickboxing training regime and as a result, Kickboxing survived and has involved today into Mixed Martial Arts. Pacquiao donated both his boxing gloves and shoes to be later put on permanent display in the museum. “This is a good thing for both boxing and the Filipino community. He is truly an inspiration and having him in the museum will keep his legacy alive for many generations,” adds museum board member and film director Art Camacho who was on-hand for the induction. The Martial Arts History Museum's Hall of Fame began in 1999 and 10 legends, pioneers, founders or champions are selected each year. It is the martial arts' most prestigious award and it is the only hall of fame recognized by the museum as the official hall for the martial arts. The museum's hall of fame is purely based on historical achievements that have changed the world. The museum itself does not select the nominees, only the previous hall members have that honor. Each year the museum releases their hall of fame book documenting each historical contribution. The Martial Arts History Museum is located at 2319 W. Magnolia Blvd., Burbank, CA 91506 with their website at www.Mamuseum.org. It is a non-profit 501(c)(3) organization and is fully supported by visitation, donations and memberships. The museum has launced a new campaign entitled "Impact Our Future" in order to encourage financial donations to move the museum into a much larger facility.